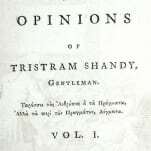 The Life and Opinions of Tristram Shandy. 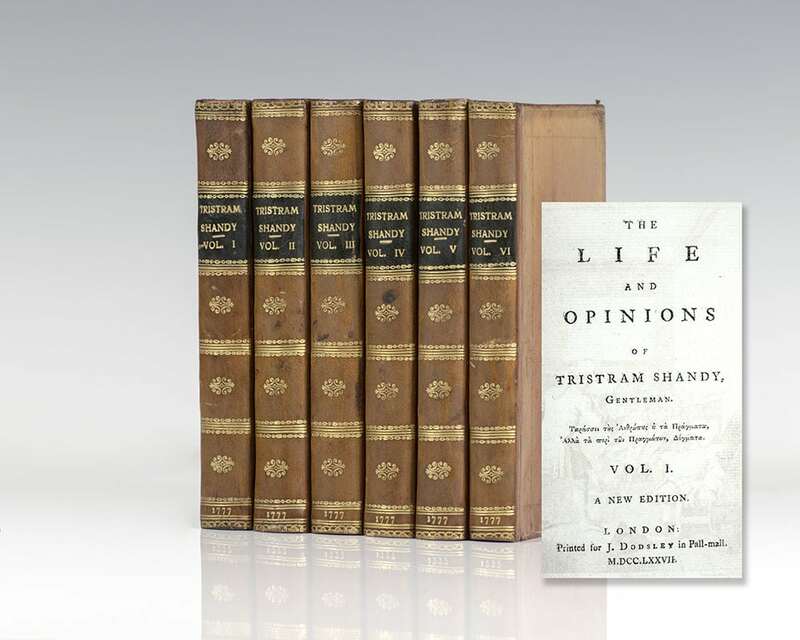 Finely bound set of Sterne’s Tristram Shandy. Octavo, 6 volumes, bound in contemporary full polished brown calf, black morocco spine labels, smooth spines with gilt rules and decorations, marbled endpapers. 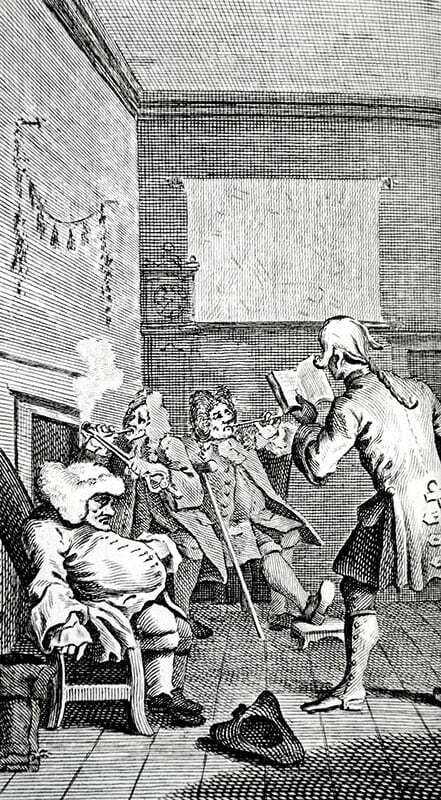 Frontispiece in volume one after Hogarth. In near fine condition. 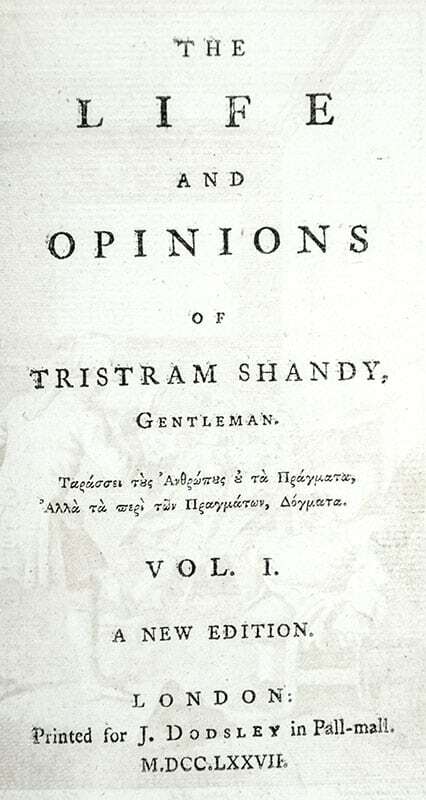 Tristram Shandy is considered by many the first modern novel and the father of stream of consciousness writing. It is perhaps the most literal example of a novel available. Sterne was an Anglican Vicar who was influenced by Pope, Locke, Swift and Cervantes. His narrative devices and styles have indelibly influenced many modern and postmodern authors: James Joyce, Virginia Woolf, Milan Kundera, Salmon Rushdie among others. Sterne, Laurence. Edited by James P. Browne. 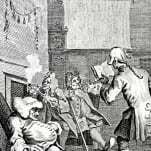 The Works of Laurence Sterne. London: Bickers & Son, 1873. Finely bound example of Sterne’s works. Octavo, bound in three quarters morocco over marbled boards, gilt titles and tooling to the spine, morocco spine labels, all edges marbled, frontispiece engraved portrait of Sterne to volume I. With the life of the author written by himself and several unpublished letters. In near fine condition with a touch of rubbing. London: Bickers and Son, 1873. Edition de luxe, limited to 200 sets, with this being number 19. Octavo, bound in three quarters leather, elaborate tooling to the spine, top edge gilt. In near fine condition. Presents beautifully. Astronomical Tables with Precepts both in English and Latin for Computing the Places of the Sun, Moon, Planets, and Comets. London: Printed for William Innys, 1752. 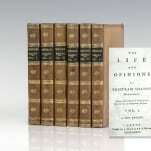 First edition in English of Halley’s classic work. Quarto, bound in contemporary full calf, gilt titles to the spine, gilt embossed stamp of The Society of Writers to the Signet on the front and rear panel, copper-engraved frontispiece portrait. Edited by John Bevis. In very good condition with light rubbing and wear. London: Chatto & Windus, 1912. 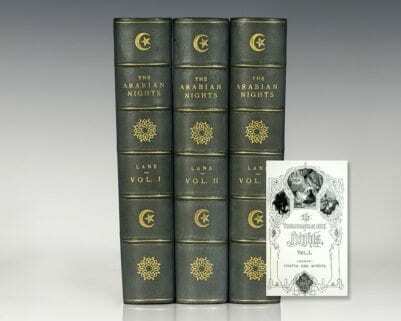 Octavo, 3 volumes of The Thousand and One Nights. Bound in three quarters morocco, gilt titles and tooling to the spine, marbled endpapers, gilt topstain. Translated from the Arabic, with copious notes by Edward William Lane. Edited by his nephew Edward Stanley Poole. Illustrations from the designs of William Harvey. In near fine condition. An attractive set. 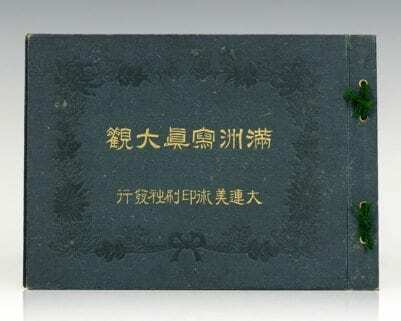 Photographic View Book of China, Manchuria, and Korea. First edition, oblong quarto, original boards. Gilt-lettered cloth, string-bound. Text in Japanese with captions in both Chinese and English. Illustrated with photographs throughout, large folding panorama of the Great Wall of China; folding map of Korea, Manchuria and portions of northeastern China. A unique record of history. The Works of Booth Tarkington. Garden City, NY: Doubleday, Page and Company, 1918. The autograph edition of the Works of Booth Tarkington. 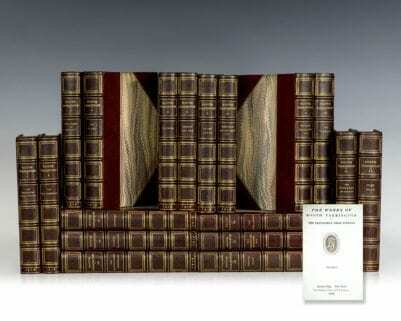 Octavo, 18 volumes, bound in three quarters morocco, gilt titles to the spine, raised bands, gilt topstain. In fine condition. Signed by Booth Tarkington in volume one. A very nice set.